I have functioning rear disc, woo hoo! 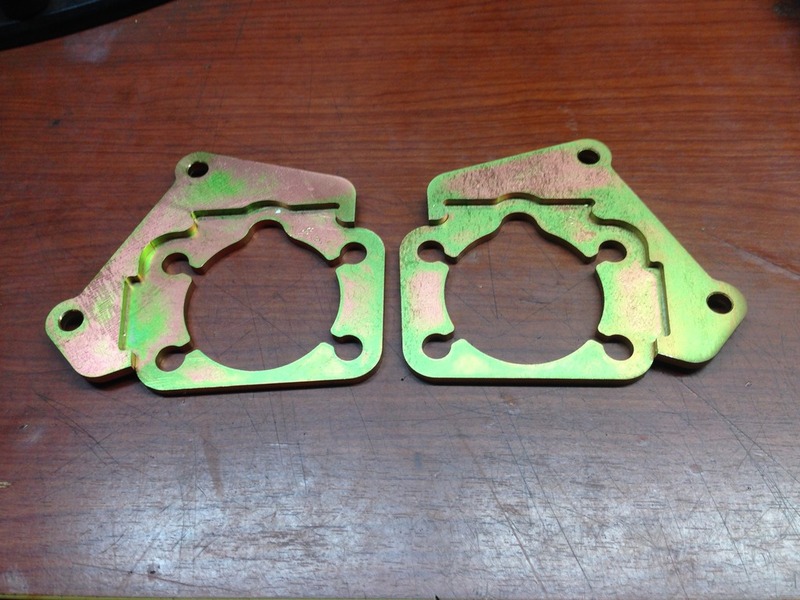 The Scarebird brackets are zinc coated according to their website. I'll post pics and a few issues I ran into when I get some time. Got everything on and working yesterday. The parking brake cables were the toughest part as apex said, the gas tank is just in the way. 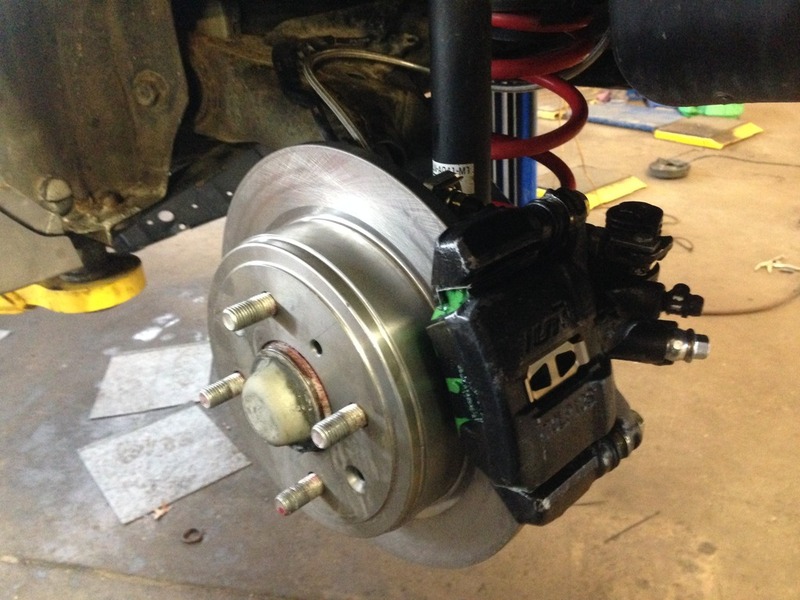 I ended up painting the calipers and the mounting brackets. I did run into a few problems. 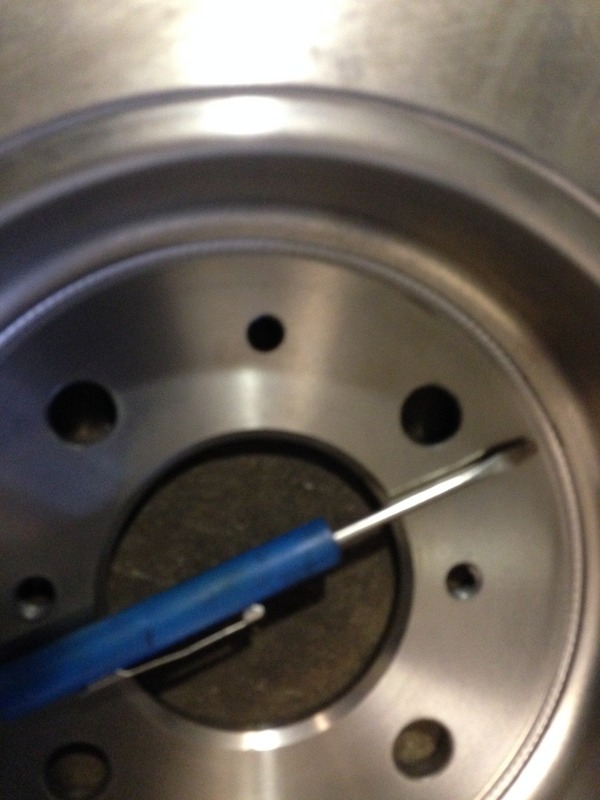 I was test fitting things as I was going and discovered that the hub wouldn't sit flush inside the rotor. Not sure if the crappy Advance rotors I got weren't machined correctly or if the hub face on an Integra is slightly smaller than our Fits. 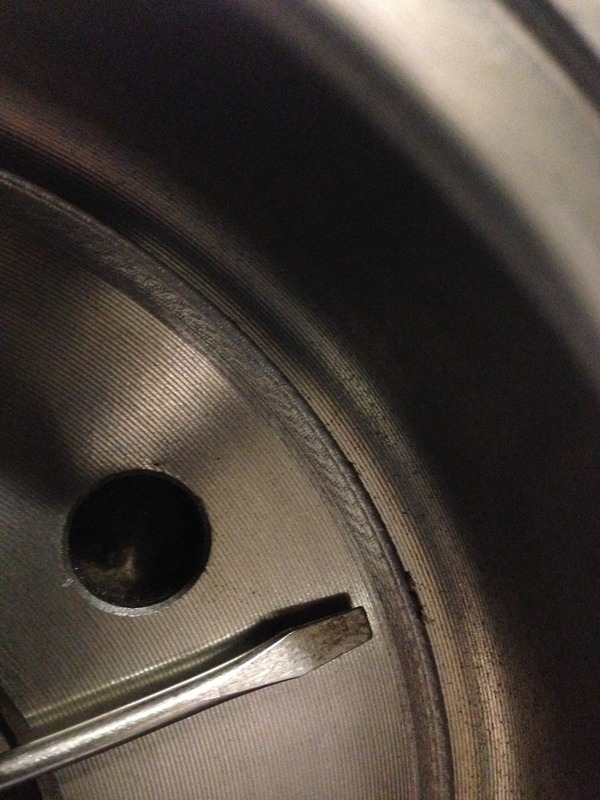 I ended up putting the rotor on the lathe and machining the lip out. You can see in the pic the area I'm talking about at the tip of the screwdriver. The second pic shows a close up of the area I machined off. 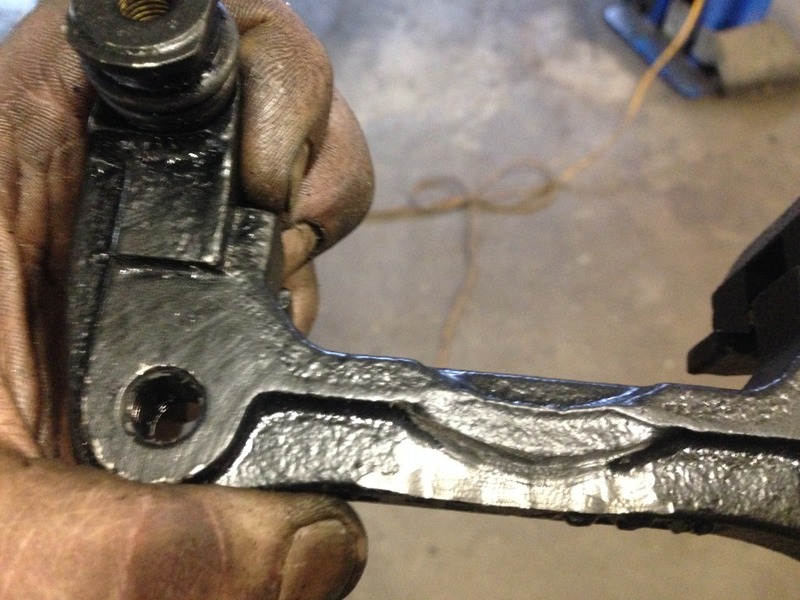 Next problem was the caliper carrier. I was bolting it up to the Scarebird brackets and it kind of felt funny as I was tightening the bolts. I pulled it back off and could see were it was hitting the bracket, both pieces had been painted so I could see were they had touched, preventing the carrier form sitting squarely on the bracket. I took a die grinder to the carrier, I didn't want to grind on the Scarebird piece. Here are pics of were I had to make a little extra room. Other than that it went well. So far I only drove home with a trunk full of winter wheel and boxes so I didn't get a chance to see how it feels. I plan to go for a drive today and test everything out. A huge THANK YOU to apex for making this easy for the rest of us!!! And sorry for the crappy potato phone pics. Last edited by ragingti; 04-12-2015 at 09:09 AM. 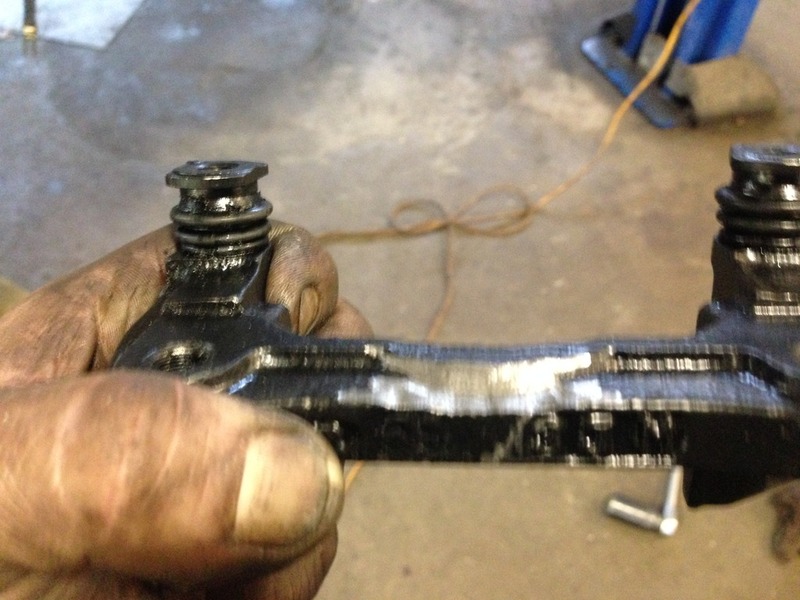 i didn't have either of the issues you did with the rotor and caliper bracket... but glad you got it sorted! Yup! Those aren't too shabby... though I am curious with how they will move with the strut/caliper as you go from lock to lock. With my first set of Techna-Fit lines they actually would either stretch completely out and bind with a similar design OR rub against the inside of my wheel. This was with my GD being about 1/2 to a full inch lower than stock... After contacting Techna-Fit, they sent me new lines and updated their product afterwards. ^.^ So be mind full of this please after install and check your clearances. Yup! Those aren't too shabby... though I am curious with how they will move with the strut/caliper as you go from lock to lock. So far so good, I've had the front wheels off a few times and no signs of rubbing. I also checked the clearance with the wheels on turning from lock to lock and everything looks good. Thanks for the heads up on checking those. Last edited by ragingti; 05-05-2015 at 07:03 PM. Great thread. Thanks for all the information from everyone. I just got my Scarebird brackets in. 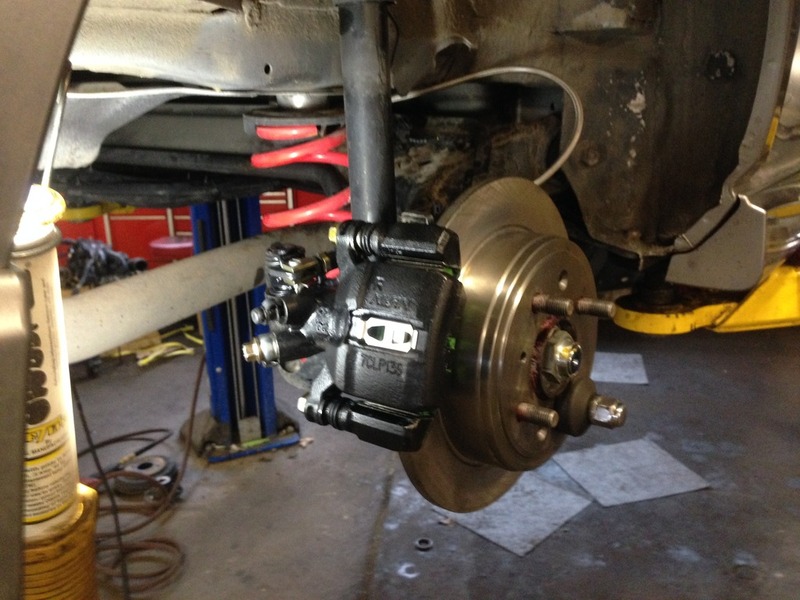 I was hoping to use the brackets to install Wilwood 1997 Integra rear brake kit 11". Does anyone think this will work? 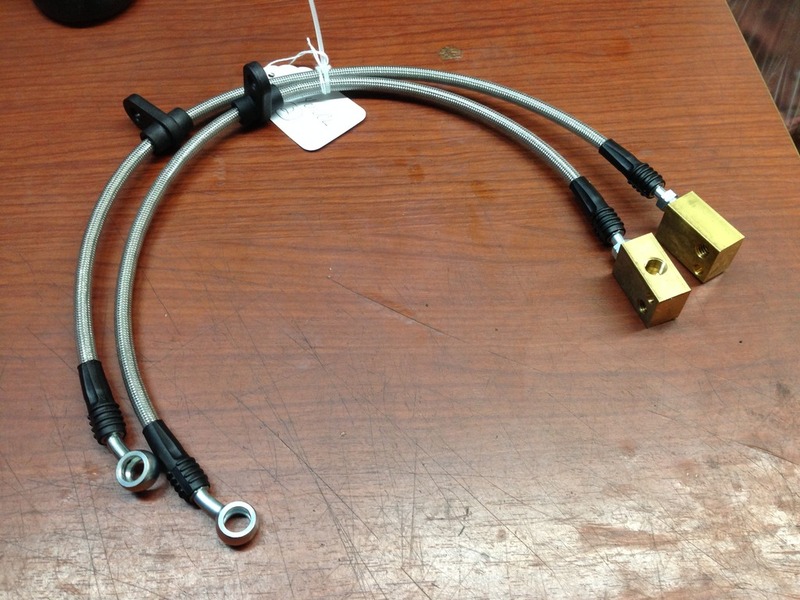 Will the parking brake cable from Wilwood for the 97 Integra work with the Fit? 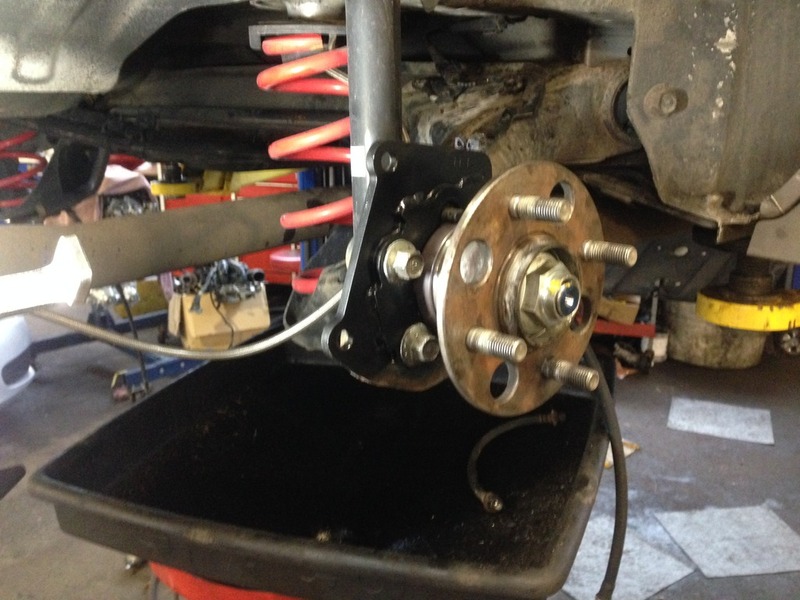 Will the Wilwood brake lines fit appropriately? Does this sound possible as a bolt-on project? If I had to guess the brake lines and parking brake cables won't work. There aren't pictures or lengths of the parking brake cables on Wilwood's site(or I couldn't find them). Apex may have more insight. The bracket on bracket part should work. That's going to be a LOT of rear brake. Is this just for show or performance? 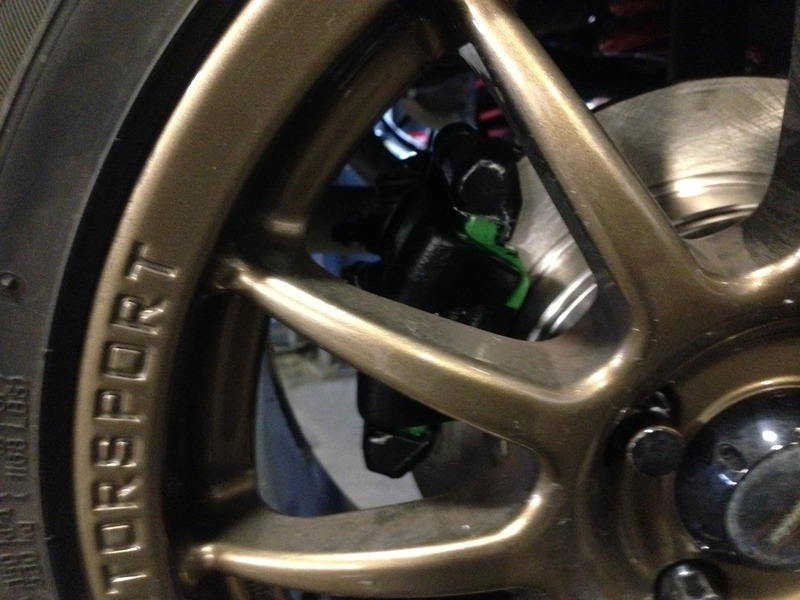 Wilwood parking brake cable seems to be 68", the shortest as far as I can tell that has been used on Fitfreak. Did you guys have any length of cable "leftover"? It seems to be 2 inches shorter than Apex, I think. I have been reading too much, I will go back and try to make a spreadsheet so I can better decide. I am going with the Wilwood rear because the other rears I have seen for under $1500 have the, I think its called floating, caliper and they don't look as nice. I think I can get the wilwood rear for $830, not including lines or parking cable. So basically, they are the cheapest, nicest looking ones I could find. Unless I missed something? Do you guys still have the original parking cable? Could you measure it? Wow, that's a cool mod. I think the Fit have really good braking as it is, but that's a good mod and not to expensive. I guess if your Cars is modified with engine swap or turbo it's important to have more braking power. maybe a future mod I could do. One question, does the ABS and all the brake force balancing stuff still work? Because I do like the FIT ABS, not to sensible, and I like it in winter. Last edited by Sylak; 06-19-2016 at 01:02 PM. Does anyone know about the effects of this in regards to the OEM master cylinder? How is the pedals feel? Mushy, stiffer? Last edited by Bumnah; 08-20-2015 at 11:35 AM. 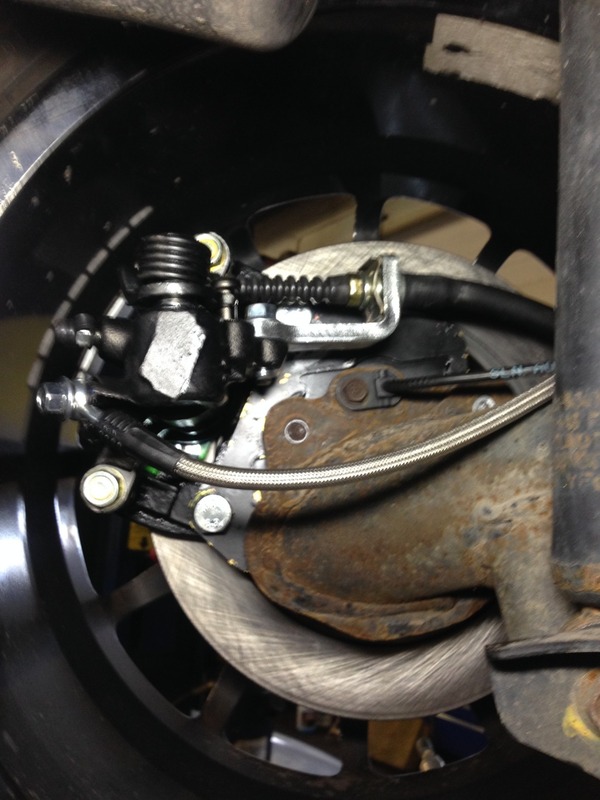 what do you mean about the master cylinder? is the GE similar? any different parts?